Had this product before. Absolutely fantastic, use it in the morning after a shower to replenish my skin, and at night to protect it.... Great for people with oily skin as it clears up excess oil without removing essential ones.. Highly recommended. I've come back to this one a couple of times as it really does a good job. After a couple of weeks of being back on it, there is a noticeable difference in reducing the fine lines on my face. I like the matte finish and light feel. It's not greasy like some face moisturisers but still keeps my face hydrated throughout the day (especially good when working in an air-conditioned office). This is a winner in my eyes. I am rarely pleased by a skin care product but this one is so good. It really does what it says. I have dry skin and (especially during winter) I need a good moisturiser. I have to use a bit more of this to get good moisture but the results are great. It is absorbed so quickly by my skin and I also love the subtle fragrance. I have been using this for almost two months and I love it. My skin really looks better and it also helps with the flakes and redness. This is now a repeat purchase from LS, I feel as though this product will have you reaping the benefits it's promising after prolonged continuous use. really felt that it lived up to its expectations and was certainly hesitant at first thinking it was promising too much. Had been suffering from acne and was on antibiotic treatment which made my skin really dry and flaky, thought id try this and it was a lifesaver! feels so smooth on my skin and clears up any dry flaky areas instantly! I swear by it now! 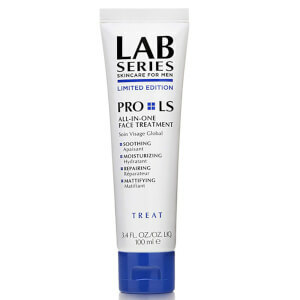 At first I wasn't sure Lab Series Skincare for Men Pro LS All-in-One Face Treatment would be as good as it made out. It feels so light and absorbs well. I would refuse to use anything else from now on! 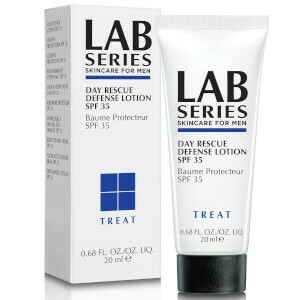 I used to use the Lab Series Daily Defence SPF 15 which I absolutely loved. 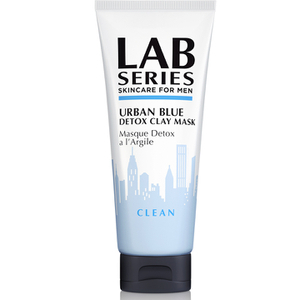 Then I got offered a free (full sized) sample of this from Lab Series to trial before it got released and now I'm a total convert. It really does what it says on the tin. 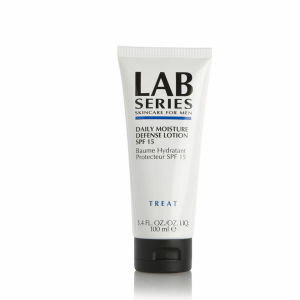 Firstly, the moisturising is at least as good as the Daily Defence, which is great and not too oily. But it also seems to repair skins as well. For years I've had dry flaky skin at the base of my nose and on my forehead and no product did anything (even after professional facials) to help. Within days of using the Pro LS this seems to have corrected itself and is no longer a problem. 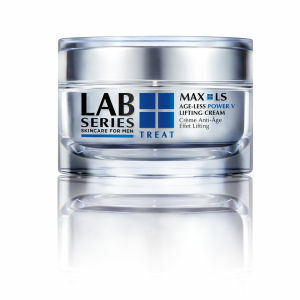 As with all Lab Series product it has a very light/neutral fragrance so no irritation there. And it is not oily at all, leaving a nice matte finish. The proof of the pudding, however, is that having started using it, I've been IDed practically every single weekend - at bars and clubs but also at supermarkets (buying wine with my full weekly shop!). I'm just over thirty and I do look young but I had stopped being regularly IDed a few years ago. Now I'm feeling a little bit like Benjamin Button, but hey, I'm not complaining! Awesome product and I thought they would be pricing this higher so I think it's also great value.